Tripadvisor (NASDAQ:TRIP) CEO Steve Kaufer put on a confident game face in the wake of Thursday’s disappointing second-quarter report, but owners of TRIP stock — current or prospective — weren’t buying it. Indeed, they were selling it — in spades. Tripadvisor shares ended Thursday’s action down by a little more than 11%. The stock perked up a bit on Friday, though just barely… not nearly enough to lay the groundwork for a rebound. Holding it back more than any other factor is the market’s realization that the company has become a victim of the “new normal” in making travel plans online. Last quarter’s top and bottom lines weren’t horrifying. Earnings of 41 cents per share of TRIP stock were better than the 39 cents analysts were calling for and though revenue of $436.1 million fell short of estimates, revenue was still up 2% year over year. EBITDA grew 8%. When one breaks down where that revenue came from, however, eyebrows start to raise. Hotel-booking revenue, which is the company’s (much) bigger business, fell by 4%. Non-hotel (web traffic/advertising sales) revenue grew 22%, but the latter only makes up about one-fourth of its total business. Were last quarter’s nuances a one-time matter, investors might find them forgivable. They weren’t a one-time thing, though. 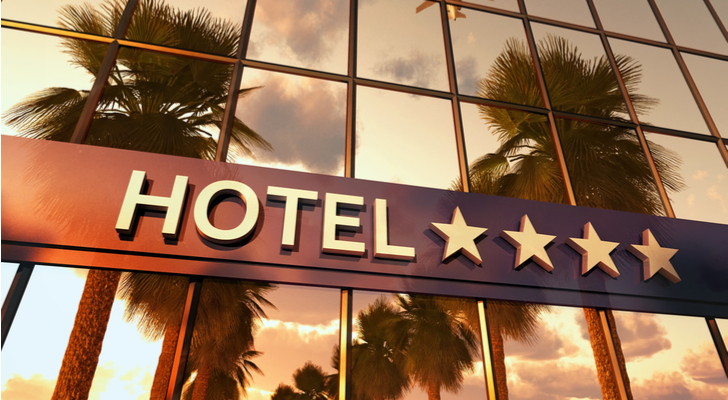 In the same quarter from a year earlier, its non-hotel business saw revenue grow to the tune of 31%, while its hotel business saw growth of only 3%. Little has changed in the meantime. It matters. As was noted, Tripadvisor’s hotel-booking business is by far the bigger arm. If it’s not doing well, the company isn’t doing well. And the future on that front doesn’t look encouraging — and not just for temporary reasons. Tripadvisor makes money a couple of different ways. Primarily it extracts revenue from the likes of Expedia Group (NASDAQ:EXPE) and Booking Holdings (NASDAQ:BKNG) when Tripadvisor’s would-be travelers reserve a hotel room (through the Tripadvisor site) with one of the hotels Booking and Expedia are promoting. Though it’s often difficult to distinguish who’s offering what, Tripadvisor is just the middleman. And that’s the crux of the problem. At one point, Tripadvisor offered clear value to customers like Booking and Expedia. The internet inherently facilitates moves toward greater efficiency and cost-effectiveness, though, and perhaps without even planning on making such a decision, Expedia and Booking (and others) are spending less and less on maintaining a presence at the Tripadvisor site and rival sites like Trivago (NASDAQ:TRVG). Guggenheim Partners research analyst Jake Fuller offered up some eye-opening numbers to that end. He notes that after the two companies spent 26% of their revenue on marketing on 2016, that number was dialed back to only 20% last year. For this year, Fuller thinks the companies will only spend about 10% of revenue, collectively, on promoting themselves at sites like Tripadvisor. That shift has forced Tripadvisor to curb its own marketing spend. It’s not just an ongoing deterioration of the value it can offer hotel-promoting outfits Expedia and Booking, however, nor is it the success of Trivago that’s created something of a price war at an inopportune time. Alphabet (NASDAQ:GOOGL, NASDAQ:GOOG), through its Google division, has slowly but surely become the dominant force inn the online travel agent business. The shake-up began in earnest in 2011 when Google acquired online travel-booking outfit ITA. The search engine giant has since parlayed that purchase into something far bigger than most would have imagined at the time (and prospective competitors were plenty worried then). It didn’t hurt that it was and still is the western world’s favorite search engine, as well as a provider of online maps that intuitively connect people with places — for a fee, of course. End result? Skift Research explained last year that Google’s travel-booking business alone could be worth $100 billion, which makes it bigger than any of the other players in the business. Perhaps more than anything, though, it was Google’s rise in the travel-booking space that blurred the lines between what Expedia is, what Tripadvisor is, and why one needs the other. Nothing is insurmountable. Tripadvisor is doing very well with initiatives that don’t involve reserving a hotel room. For instance, it’s seeing tremendous growth in terms of connecting people with events, and ad revenue stemming from reviews is robust. It’s just not enough, though, given that arm’s modest revenue potential to Tripadvisor. Non-hotel revenue is only about one-third of Tripadvisor’s hotel-booking revenue, and there’s no reason to think the industry’s new competitive dynamics are going to shift back to the old model anytime soon. Companies just don’t need Tripadvisor like they used to. Subsequently, TRIP stock may be a name investors are better off avoiding. Article printed from InvestorPlace Media, https://investorplace.com/2018/08/headwind-isnt-cyclical-trip-stock/.